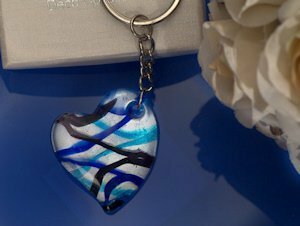 SHARE An art glass keychain makes an elegant and useful favor. This keychain from Cassiani Collections' exclusive Murano Art Deco line is handcrafted in the shape of a heart. The heart is a handmade twist of blue and silver glass so no two are exactly alike. The heart is attached to a silver metal key ring that measures 3.5" in length. They come ready to present in a white, two piece gift box stamped with the exclusive "Murano Art Deco" logo. Your guests will remember your event with each turn of their keys.